Premium Packaging is only an additional $12.00 per order from our studio. 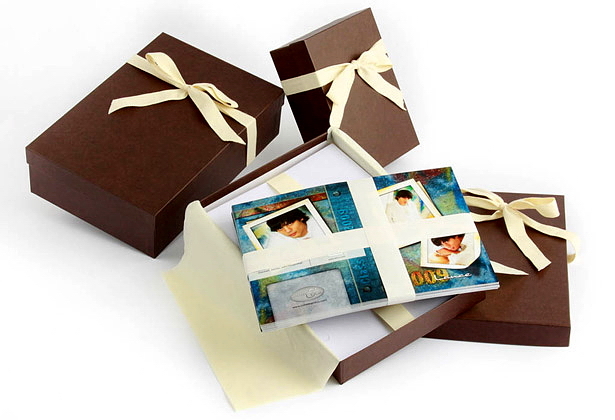 Your prints, cards, books or albums are wrapped in cream tissue paper and placed in our rich chocolate brown boxes. The presentation is finished with an eco-friendly natural cream colored cloth ribbon. Additional charges may apply if 5 or more boxes are required for packaging or for multiple copies of a printed Book. The Premium Packaging charge does not apply towards your $25.00 minimum order from our studio proofing store. Photographic prints are sealed in clear poly bags wrapped in tissue paper. 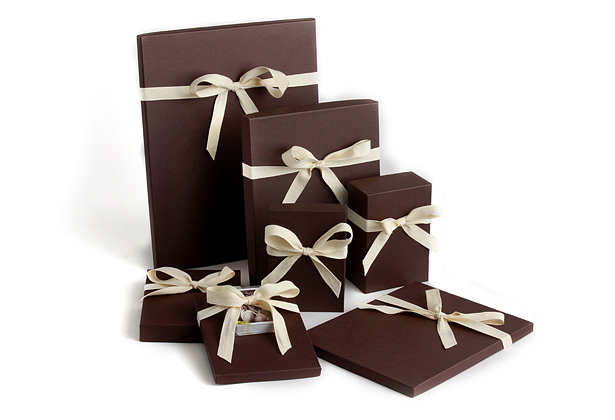 Chocolate brown boxes finished with natural cream colored cloth ribbon available in sizes up to 11x14. Available for all printed card sizes, flat or folded. Cards are banded and wrapped in tissue paper when boxed. Printed books and albums are packaged with a cardboard insert or riser and tissue paper. 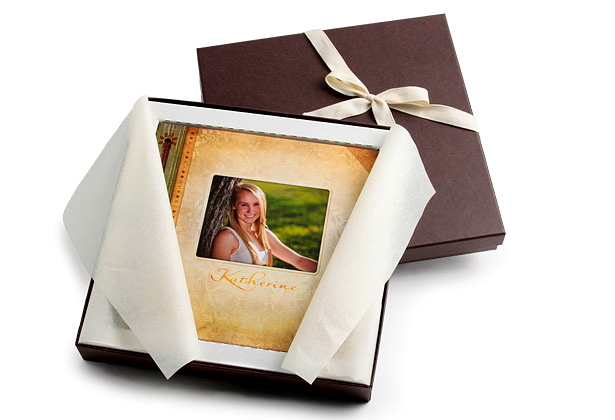 Your photographic prints are sealed in clear poly bags wrapped in cream tissue paper and placed in our rich chocolate brown boxes. The presentation is finished with an eco-friendly natural cloth ribbon. Currently, Premium Packaging is available for photographic print sizes from wallets and proofs up to 11x14. Prints larger than 11x14 will be packaged the same as a normal order, in our normal poly bags with cardboard. Premium Packaging is available for printed Cards ordered from our studio. Your cards are banded, wrapped in tissue paper and also placed in chocolate brown boxes finished with the eco-friendly natural cloth ribbon. Premium Packaging is currently available for all our printed Card sizes: 4x5.5, 5x5, 5x7 Flat or Folded, as well as 5x7 Wide Format, 5x5 Trifold, and 4x5.5 Accordion. Some sizes and configurations will have a cardboard or paper filler so the cards are snug inside the box. Please note, multiple card sizes will not be boxed together. Q. What is the largest print size that can be premium packaged? A. 11x14. We can package photographic prints sizes from wallets and proofs up to 11x14. Q. How will my order be packaged if I order prints that are too large for premium packaging, along with prints that can be premium packaged? A. Prints larger than 11x14 will be packaged the same as a normal order, in our regular poly bags with cardboard. Prints 11x14 or smaller will be packaged in our Premium Packaging if ordered. Q. Will my various print sizes be packaged individually? A. Your entire order will be packaged together in one box, depending on how large the order is. However, each print size will be individually packaged in its own right-sized poly bag. Q. What colors of Premium Packaging do you offer? A. We currently only offer chocolate brown boxes. Q. What do you offer for ribbons? A. Boxes are finished and tied with a cream, eco-friendly natural cloth ribbon. Q. Can you sell me just the boxes? A. Boxes are only available with a photo related order, boxes cannot be purchased individually.